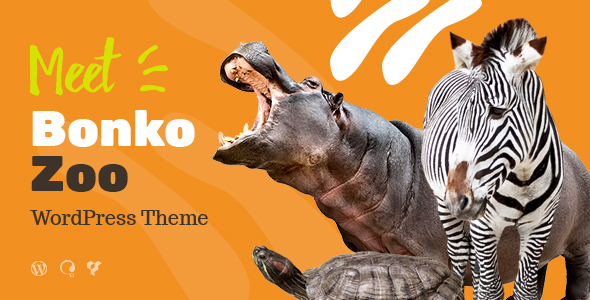 Bonko is a beautiful, stylish & powerful animal / pet care WordPress theme. It’s good for a zoo, safari activity, circus, and aquariums. Bonko will also be useful for those looking to open an animal shelter or pet services of any kind (like pet grooming or a veterinary clinic), or any other topic-related business. Go ahead and check this flexible WordPress theme with infinite customization capabilities! Bonko is 100% responsive and Retina ready looking stunning on all devices. It support Instagram Feed and MailChimp for WP, it is compatible with a bundle of premium plugins, like Slider Revolution , Essential Grid, and WPBakery Page Builder (in case you wish to get more creative and add new page layouts). We also supplied our theme with the powerful charitable functionality, to give you a chance to raise money for animals saving.